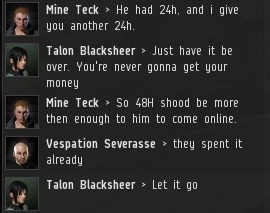 The EVE community was delighted by the SoundCloud recording of Mine Teck's complaints about the New Order on TeamSpeak. 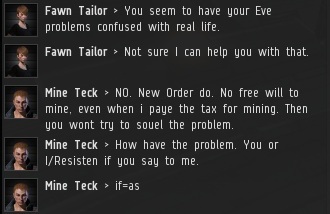 Some are already comparing Mine Teck to other highsec luminaries, such as Moonsong Miner and Capt Lynch. 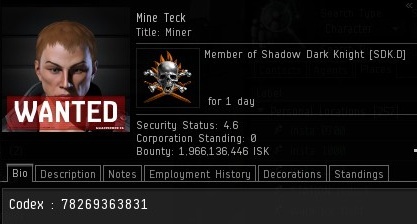 Mine Teck received a 2 billion isk bounty, courtesy of Powers Sa of the Goonswarm Ministry of Love. Some of the bounty has already been collected, but there's still a long way to go. Mine Teck wasn't satisfied by the outcome of the conference on TeamSpeak. In particular, he objected to the way Agent Dr Tyler invited multiple Agents to join the conversation without Teck's permission. Teck convoed Agent Fawn Tailor and requested another TeamSpeak conference, this time strictly one-on-one. Teck repeated his threat from the conference: If his problems were not solved, he would join the anti-Order resistance. The stakes could not be higher. Teck conveniently provided some exposition. He had purchased mining permits (at the wrong price) for nine characters, but did not include a pledge of loyalty to me and/or the New Order in their bios. This is a mistake. It's like getting a driver's license but not carrying it with you when you drive your car. To receive the benefits of your permit, you must display it in your bio. Negotiating with an Agent of the New Order can be trying, given our immense power. But Teck had a bargaining chip he intended to leverage: Kill rights on some -10 sec status ganker alts. Fawn was prepared to play hardball. Teck is not easily intimidated. He was prepared to unleash the full force of his power. The situation escalated quickly when Teck unveiled his DDoS threat. If properly executed, it could have a devastating effect on the New Order's conferencing capability. The New Order is no stranger to DDoS threats. When this site was still new, miners often threw around the idea of DDoS'ing MinerBumping. The site is hosted by Google; their servers have withstood the attacks so far. Teck claimed the moral high ground. 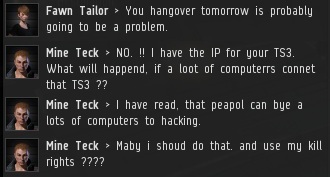 According to him, DDoS'ing a TeamSpeak server is no less criminal than charging 10 million isk to mine in a highsec ice field. The negotiations between Fawn and Teck began to disintegrate. Interestingly, Teck believed that if a settlement could not be reached, and if the two sides went to war, he would still receive his money back. No wonder he thought he was negotiating from a position of strength. Teck took the matter to local, appealing to the Kamio mining community for support. Even rebel Talon Blacksheer was unmoved. The deadline was set. Either the leader of the New Order would reach an agreement with Mine Teck, or something bad would happen. Could war be avoided in time? Was this the end of the New Order? Enjoying a nice strawberry shortcake while reading this. And by his words, hilarity ensues. Go on, go, Mine Teck! Fly like a beautiful butterfly! Wait, there's a TS server? I particularly liked the part about paying for computers to hack the ts3 server. Much more economical than 9x10 mil isk for permits, and a bio change. "What in the HELL are you doing?" - Mine Teck (2013). But no he lied and now we have the repercussions to deal with. I need some strawberrys to help me through this. Fawn Tailor > Mine Teck: I suggest you drink some water and go to bed. All RP aside, I do wish he had listened to our suggestions to stop drinking alcohol and start drinking water, go to sleep; because, I'm pretty sure he said he had to drive 5 hours or something, or go to work within hours of the TS conversation. 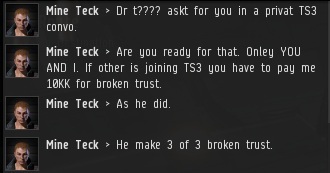 Where's my 90 million isk? It's not like there isn't translator software; Google has it, it's not the best but it can work to get the gist. And he shouldn't have been drinking alcohol before having to drive, I'm an American and we have that stuff happening a lot. I really feel for this guy though, call me sentimental, but he got scammed. Did he do either one? We tried. It didn't work. Now, all I can do, is laugh. A troll trolling trolls. Huh. Now I've seen it all. We need to get that guy professional help. I do mean it. He needs a doctor or something. Not today good Agent Trask, perhaps a lacrymotomy. Surely they must be dry by now? Oh my a 2B bounty on this guy? You guys can probably suicide him non stop for days and get the cost of your gankalysts covered and then some unless he's only using ventures lol. Not sure how someone with 9 accounts can rage so hard over 90k in space money. "Not sure how someone with 9 accounts can rage so hard over 90k in space money." Zzez Murika and Dr Tyler have stumbled upon a fascinating case study in Mine Teck - this specimen will be a rich source of data for our researchers at the New Order Department of Space Psychology. We're investigating mood disorders resulting from excessive entitlement and misconceptions about the nature of eve online.